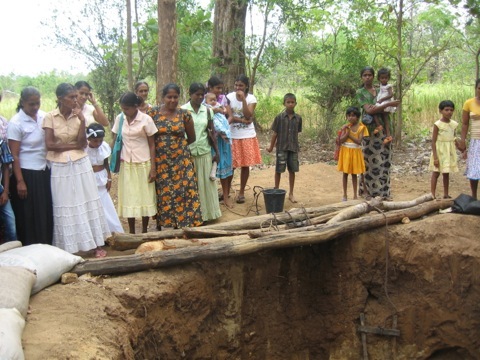 The village of Thelulla Janapodaya lies in the Wellawaya District, in proximity to two other villages where Project Sri Lanka has provided wells, namely Koonawalana and Handapanagoda. Like these other places, Thelulla Janapodaya suffers severe periods of drought and had no water locally available. Village people regularly rose at 5.00am to set off on a walk of several kilometers to obtain water prior to this project. The provision of an agro-drinking well here was one of the charity’s main projects for 2013-2014. It was funded by the community of Spittal in Berwick-upon-Tweed, Northumberland, UK. Thellula has a population of 3054 people in 452 families, so large numbers are benefitting from the new well which has a diameter of 15 feet. One of the village ladies named Ranmanike owned land which she generously donated for the site of this well which benefits the whole community. Trustees re-visited this village in 2018 and learned of the significant droughts that had affected the area. The village people have responded to this by diversification of agriculture and have turned to animal husbandry rather than crop growing. The well provides water for the village people and drinking water for a herd of 14 cows. The cows give sufficient milk for the people plus some left over which is sold. There are also hens in the village for egg production and sale. Some crops are still grown including peanuts, papaya, maize and pineapple.